Product information "10th Olympic Congress, Varna (Bulgaria), 1973. Edge - embossed text Sport for a Peaceful World"
The obverse depicted Bulgaria coat of arms. In the outer circle of the coin has an inscription “Peoples Republic of Bulgaria”, the nominal value of 10 leva and the year of issue – 1975. The reverse side depicted Roman bronze coin, minited in Philippoupolis. Below is the logo of IOC and an inscription “Varna”. 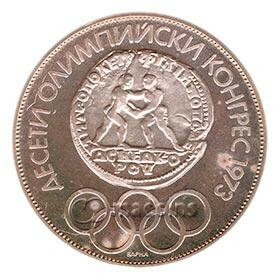 In the outer circle of the coin has an inscription “Tenth Olympic Congress 1973”. Edge: embossed text "Sport for a Peaceful World"
Related links to "10th Olympic Congress, Varna (Bulgaria), 1973. Edge - embossed text Sport for a Peaceful World"